Two Pawns. Two Eternal Adversaries. Who will win? – The Game of Love and Death – now available on Audio! 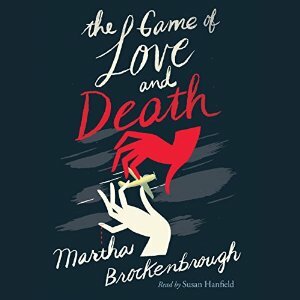 I am so excited to celebrate the audiobook release of The Game of Love and Death written by the magnificently talented Martha Brockenbrough and published by Scholastic Audio. The Game of Love and Death captured my heart from the first moment my eyes found its pages and I continued to think about the characters and riveting storyline long after I finished narrating this deeply moving book. The story begins in 1920 where we are given a glimpse into the lives of two sleeping babes who are both about to become pawns in a deadly Game of Love and Death. Two eternal adversaries, Love and Death, choose their players wisely and the game is set. We are then propelled 17 years ahead to 1937 where these two infants have grown up to become Henry and Flora. A young man who lives to play the bass and a young woman who desperately wants to become the next Bessie Coleman. Both share a passionate love for music and amidst the jazz clubs and flight strip, romance blooms. This entry was posted in Audio Books, Narration, News, Press and tagged The Game of Love and Death; Martha Brockenbrough; Scholastic Audio; YA; Teens; Pawns; 1937; Susan Hanfield; Narration; Bessie Smith. Bookmark the permalink. ← 96 SOULS to screen Friday June 3rd at Phoenix Comicon!